Featuring an outdoor pool, this hotel is located just off Route 77 and 1 mile from central Raymondville. Free WiFi is available. Cable TV, a microwave and a small refrigerator are found with each wood-furnished room at Texas Inn and Suites Raymondville. A work desk and ironing facilities are also included. 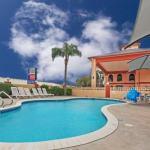 Guests of Raymondville Texas Inn can enjoy outdoor recreation with a swimming pool and BBQ facilities. Raymondville Country Club is less than 10 minutes’ drive from Texas Inn. Harlingen city centre is 30 minutes’ drive away..
We plan to add more related stuff like: pet friendly hotels in Raymondville, Texas dog friendly hotels in Raymondville, dog parks in Raymondville, pet stores in Raymondville, TX, and pet spas in Raymondville. Keep checking for more!